PufferMind is an advertisement-supported program better known by the name PMLeads. Once the application is installed onto your browsers, it will present “Ads by PMLeads” and online offers “Provided by PMLeads”. You should not click on these advertisements at any point. In fact, if you discover the suspicious ads, you should make sure that the advertisement-supported program is deleted. Do you know how to remove PufferMind from the operating system? This article answers some of the most important questions. It is now clear that PufferMind is mainly distributed using Vittalia, Premium, and DomalQ installers. 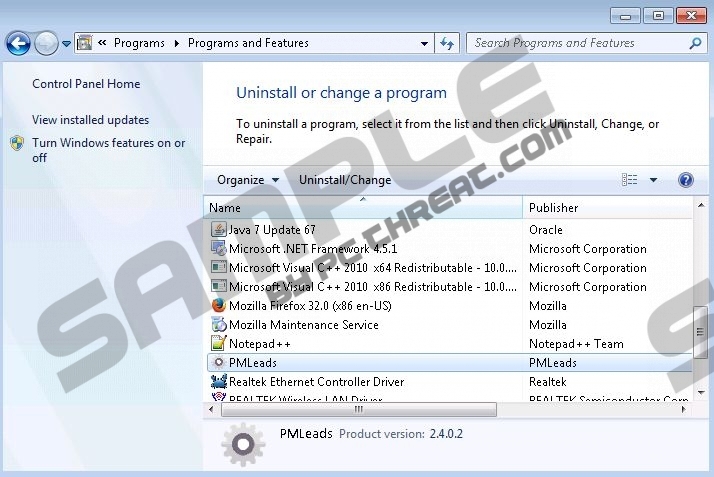 These installers may be promoted at brothersoft.com, cnet.com, softonic.com, and other popular software download sites. If you are not careful with the third-party installers, a bunch of undesirable programs could be installed at the same time. It may be extremely difficult to delete these programs, so you need to make sure that they do not find their way in. If the removal of potentially malicious, unreliable software does not excite you, you should not install Donut Leads, PastaQuotes, and similar ad-supported software as well. Even though PufferMind will enter your PC with the help of third-parties, this suspicious application does have an official website. An installer of the ad-supported program is not presented at puffermind.com; however, this website is extremely important. If you check the site after finding PufferMind installed, it is most likely that you will choose to remove the adware. The site is misleading and does not present any reliable information. In fact, the site is used to promote PufferMind as a tool for system optimization and virus removal. Needless to say, the advertisement-supported program will not delete attacking threats or speed up the computer. PufferMind has a running process called PMLeadsService.exe. If you kill this process, it is possible that the suspicious advertisement-supported program will not be able to connect to remote servers, due to which the irritating ads will stop showing up. Of course, the termination of the process is just the first step towards a successful removal. To delete PufferMind from the operating system successfully, you will need to remove the related files. Furthermore, you may have to remove other running threats as well. The manual PufferMind removal is not an operation suitable for all computer users. The application may run on the PC with even more unreliable and dangerous programs, and their removal may be even more complicated. Therefore, instead of the manual removal, we recommend all users to delete PufferMind and other active threats using authentic malware removal software. Now open the Control Panel and double-click Add or Remove Programs. Open the Start menu by clicking the Windows logo found on the Task Bar. Quick & tested solution for PufferMind removal.